Robotino is an open source robot, i.e. all the software on Robotino and all APIs are open source. This gives developers the maximum flexibility in creating software for Robotino and the certainty that this software is not affected by any open source unfriendly license. The picture above shows the main software packages available for Robotino. The operating system for Robotino is based on Ubuntu Jaunty. The kernel had been replaced by a custom made kernel with RTAI patches. Disk images with the Robotino OS can be download from the download section. Version 3.x cards run the rec::robotino::api2 interface. The api1d provides a API1 compatibility interface. You are able to connect with all 2.x software to 3.x CF cards. The Robotino simulator lets you simulate Robotino in a physical 3D simulation environment. Version 2.x of the simulator can be accessed by the rec::robotino::com C++ library and all versions of Robotino View. Robotino View is the graphical programming environment for Robotino. uses rec::robotino::com to setup a connection to the hardware/simulator. Version 3.x (including the current beta version 2.9.x) can connect to all Robotino OS and Robotino Sim versions. 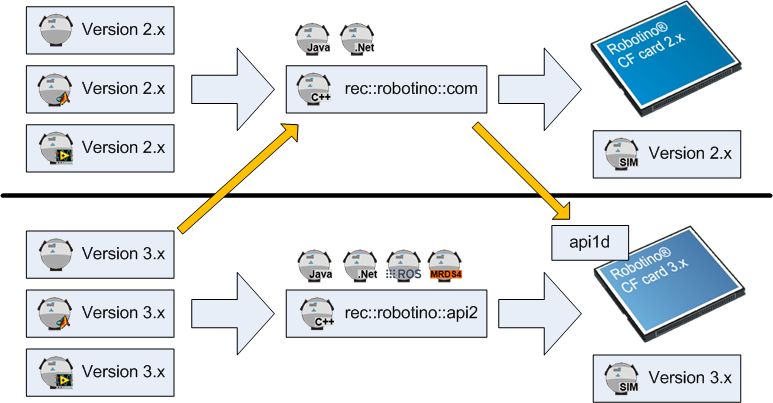 uses both rec::robotino::com and rec::robotino::api2 to setup a connection to the hardware/simulator. It automatically detects which software is running. This is a C++ library providing the main interface for controlling Robotino. See C++ programming for examples how to use this library. The library documentation can be found here. A C wrapper library around rec_robotino_com. The library documentation can be found here. A Java wrapper library around rec_robotino_com. A .Net wrapper library around rec_robotino_com. ROS drivers for Robotino using the rec_robotino_com library. Robotino Matlab drivers using the C wrapper library to communicate with Robotino. Robotino LabView drivers using the C wrapper library to communicate with Robotino. Robotino driver for MRDS4 build upon the .Net wrapper for API2. This page was last edited on 15 June 2016, at 16:08.